Recently, Google announced a new product that launches in the fall of 2010 that could finally overcome the barriers that existed in bringing the Internet into our large living room TVs. 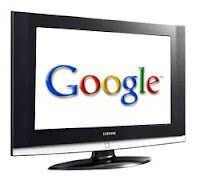 Google through their Google TV product joint venture (with Sony, Logitech, and Intel) potentially has a viable product that can fully intertwine and immerse the Internet with consumers watching TV in one device. While certainly there are other consumer electronics TVs that bring internet based applications into the living room currently, Google TV jumps in where it is strongest, and brings it forte of Search and data to the largest screen in our homes. Google TV integrates Google’s Chrome browser along with their Android operating system into a powerful combination that combines the Internet and TV and it will work on all existing TVs with an addition of a new Logitech set-top box. This set-top box will allow for broad adoption given the simple fact that it won’t force consumers to purchase a new $1,500 flat screen TV. Some details have been released, so if you haven’t seen them, go here for the announcement at the Google blog, go here for a column talking about the potential ad formats, and here at YouTube for the intro video. 1) TV viewing will be “searchified.” TV programs will be able to be searched regardless of the transmitting platform. With these new capabilities, you could search for “24” within the TV browser and view episodes on YouTube or Hulu, see if it’s showing on traditional cable, streaming on Netflix, or available on any other platform. What that means is that even more content, especially video content will need to be optimized and described so that all the great digital content that exists can be found. 2) Highly targeted and consumer initiated advertising. Based on what Google understands about your viewing habits, your demographics, your search activity, and the digital content you are consuming, it could do a great job at targeting behaviors. Google could build upon the geographic/demographic information it knows since your TV set is wired to an actual address and serve highly targeted ads to you. Much like what we all have experienced with Google over the past years, consumers choose which ad they want to engage with, or not at all. 3) Unique application adoption. I could see Google TV helping to move application adoption much faster than other internet connected home devices such as Sony’s DASH, the Chumby, or even many of the new internet connected TVs. We could have applications that alert consumers on incoming texts, scores, Facebook status changes, breaking news emails, and other updates. All while we are sitting and watching the Bears game or our favorite reality TV shows. I think that since Google TV has come out I have been able to maximize my enjoyment for TV and surfing on the net. Before I had to go to the pc room and then go to watch TV in the other or vice versa. It sure can get uncomfortable sitting at a desk for awhile, and now I can do everything as before right from my sofa. I work at DISH Network so that's where I had the chance to work with Google TV for the first time and I was hooked.